Written by Frank Cottrell-Boyce and directed by Sheree Folkson, “In the Forest of the Night” riffs on much the same plot as the classic “(Nothing But) Flowers”: The Earth is taken over by its flora, and nobody (least of all our heroes) is quite sure what to do about it. What separates it from other episodes is the level of agency granted to the characters. The Doctor and Clara spend the entire episode trying to figure out what or who has caused trees to grow all over the world, sprouting to full size literally overnight. To further raise the stakes, there’s also a giant solar flare threatening to extinguish all life on Earth, and it will likely surprise no one to discover that the timing is not a coincidence. Danny’s there as well, but as he and Clara were leading a field trip when the trees showed up, he’s understandably more concerned with keeping their students safe. And figuring out his relationship with his girlfriend – there’s that too. Danny and Clara do manage to patch things up (much more neatly than I’d have preferred, especially after the mess she’d made in episodes prior). But nobody ever really does anything about the big stuff, because in the end there’s nothing to be done. They don’t have to save Earth from the trees or the Sun, because the trees (grown by a race of alien or spirit beings that recall the spirits of Mononoke Hime) are there to save Earth from the Sun. This leads to a beautiful image at the end of the story (one of many – the scenes of London as forest really are wonderful), as Twelve and Clara observe from space while the Sun’s fire washes over the green Earth. And, really, that’s all anybody does here. Observe. In all the time I’ve watched the show, this might be the first episode I can recall where the Doctor doesn’t actually do anything. I don’t mean the episodes where he’s not in a position to do anything (think of “Flatline” again, or “Turn Left”). This is an episode where he almost literally does nothing. He’s so removed from what happens that the story doesn’t even need him. And even if it did, I can’t help thinking that it’s the wrong kind of story for this kind of show. It’s not an action episode, but it’s not really a character study either. There’s that reconciliation between Clara and Danny (who reminds her that just being alive, just being human, can be as wondrous as anything in the universe). There’s that moment when the Doctor, perhaps for the first time in his lives, must accept how powerless he truly is in the face of human extinction. There’s that moment when the Doctor finally accepts that he has a share in humanity (“This is my world too. I walk your earth. I breathe your air”). Those moments are beautifully played, but the script just leaves them there and moves on to the next thing. On some level, that script would like to be a fairy tale (especially in its opening scenes of a young girl lost in the woods), but it never quite goes all the way with that either. It seems that “In the Forest of the Night” never quite figures out what it wants to be. Ross Ruediger observes that children’s books are among Cottrell-Boyce’s many other credits. And I have to wonder if this story would have worked better on page than on screen. One of the beauties of prose is the way it lets you wander, meander through a story and just be there. And a world forest really is a nice place to wander. But a 45-minute episode, with an expected beginning, middle, and end, doesn’t always allow for that. But what it does allow for, at least in this episode, goes some way toward making up for what doesn’t work. It will surprise no one that the Coal Hill field trip ends up in the TARDIS, leading to more Grumpy Doctor moments as he tries to keep the kids away from the Round Things. 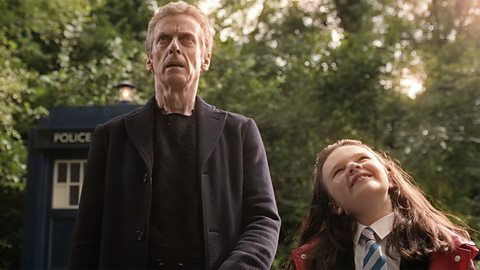 And Peter Capaldi develops a lovely rapport with Abigail Eames (as that lost little girl, who OF COURSE has a mysterious, Loraxian connection to the forest). When the story is weak, the actors are always there to carry us through it, and that’s something you couldn’t always count on from previous years (go home, “Let’s Kill Hitler,” you’re drunk). So, while “In the Forest of the Night” is a lesser episode in Series 8, it doesn’t detract from everything we’ve enjoyed so far. I just hope the season finale can deliver on all the goodwill the rest of the series has built up.